Mother’s Day is quickly approaching! This year’s guide has a little something for every mom in every price range. It’s my favorite guide we’ve featured so far! 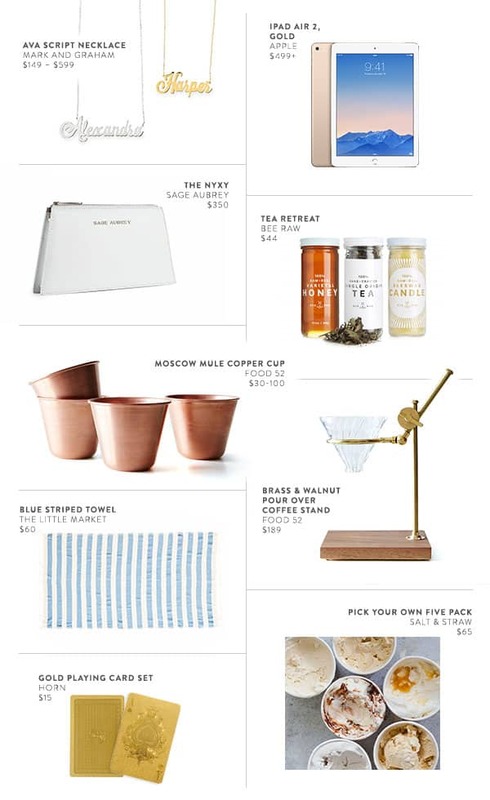 Read below for our top Mother’s Day gift guide picks of 2015! Ava Script Necklace – What mama doesn’t want to wear her child’s name around every day?! These monogrammed necklaces are so charming and make a wonderful, thoughtful gift! iPad Air 2 in Gold – Both my mother and mother-in-law have become very tech savvy and masters of their iPads and iPhones. It’s nice for them to be able to receive instant updates on their children via social media too, and especially do it in style! Sage Aubrey Leather Clutch – Sage is a new designer who launched the most beautiful handbag collection last year. They are timeless pieces that every mom would love to carry! Tea Retreat – We love this little collection of raw honey, handcrafted tea and a raw real beeswax candle. Moscow Mule Copper Cups – These stunning copper cups from Food 52 are crafted in Florida and hand spun from raw copper. They’re absolutely stunning and would make such a special gift for any Moscow Mule-loving mom! Brass & Walnut Coffee Stand – This chic and gorgeous pour over coffee stand not only looks amazing sitting out on a counter, but makes one delicious cup of coffee! Large Handwoven Towel – Give mom a set of these special, handwoven towels from the Little Market that are perfect for the beach this summer! They come is several colors and are made by local artists in Ethiopia. Gold Playing Cards – My mother-in-law loves to play cards! When she visits, we play Hand and Foot, which is a really great card game I’ve been paying since I was a kid! It would be so much fun to play (and beat her!) with gold cards like these! Five Pack Salt & Straw Ice Cream – My aunt always sends us a large box of local ice cream every year for Christmas and we absolutely love it! It’s so fun to have an impromptu ice cream party when the box arrives and we figured mom would like it too!